Flip Out Mama: Hot Wheels Nitro Speeders Review and #Giveaway! Last week, a horrible incident happened. Bean threw Tater's beloved Nintendo DSI in the toilet. It was a sad, sad day. Then, we got a package...and the day was saved! In that package, was an awesome toy! It was the new Hot Wheels Nitro Speeders toy that we were getting to review! Talk about saving the day! LOL! These are the cutest little cars ever! They are really tiny, the car actually stores INSIDE the controller, that's how small they are! They are actually around 1.5 inches long, a little bigger than a quarter. Hot Wheels® continues to elevate the radio control (RC) segment with the newest generation of micro RC vehicles, Nitro Speeders™. 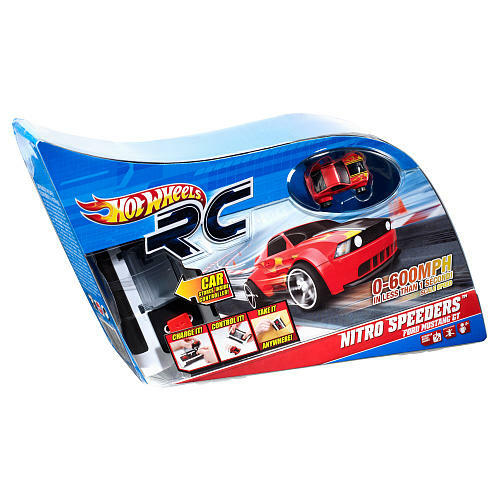 With lightning speed and precise responsiveness, the Nitro Speeders™ RC cars deliver unprecedented performance that is sure to amaze boys of all ages. 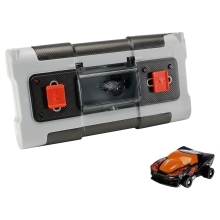 The Nitro Speeders™ vehicles come in their own carrying case, which serves as the remote control and acts as a charger to keep the cars at peak performance for portable play and racing with friends. 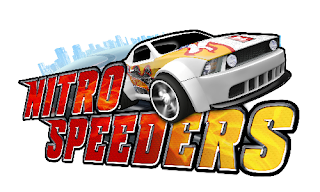 Nitro Speeders™ are the first micro RC vehicles that go fast enough to complete a full 360 degree loop. In 2011, Nitro Speeders will feature a Team Hot Wheels® Ford Mustang, Supercharged Camaro and the Ken Block Fiesta Rally Car. This little car was a BIG hit around here!! Let me tell yall, it's FAST! It zooms around here so fast, I can't even keep up with it! I love the fact that it is so tiny, I can just throw it in the diaper bag and take it with us so Tater can have something to play with when we go somewhere.. (Since now he can't take his DS... *tear*) Another thing I like about the Hot Wheels Nitro Speeders is that they use two AA batteries for the controller... but those same batteries are used to charge the car when you plug it into the controller when are done playing! LOVE that idea! The only thing that we didn't like about the car was that sometimes they go so fast that you can't really control them, and they often end up somewhere that you didn't mean for them to! But, the boys both LOVE the fact that they go so fast! One lucky Flip Out Mama will get one of the awesome Hot Wheels Nitro Speeders of their own!!! Leave a comment telling me who you would like to win this car for! +1 Follow Hot Wheels on Facebook here and tell 'em Flip Out Mama sent you! +1 For Each: Enter any of my other current giveaways, and leave a comment telling me which one you entered. Do this for each one you enter! This giveaway will end on Sept 10 ,2011 at approx 11:59 pm EST. Winner must live in the USA. Winner will be chosen via random.org and will have 48 hours to respond to email notification or an alternate winner will be chosen..Sponsoring company is responsible for prize fulfillment. I am not responsible for prizes that are lost/damaged/not received. I received a sample product in conjunction with Mom Select to facilitate this review. Although a sample product was received, no monetary compensation was received, and all opinions are my own! I'd love to win this for my 6 year old son! I entered your Linksys router giveaway. I entered your My Baby Clothes Boutique giveaway. This would without a doubt be for my Son Nicholas! He LOVES cars of any kind! I'd give it to my oldest baby - J! I like you on facebook - Sara P.
I would love to win this for my smaller brother! My Grandson Nicholas, there's not many cars he DOESN'T like, this is right up his alley. Following hot wheels on facebook and told them you sent me.